Looking for a romantic hideaway? I’m loving this cozy beach hut in North Cornwall. It’s a holiday rental, and the listing says, “A natural amphitheater, the Beach Hut is surrounded by cliffs. Set in the middle of a 52-acre site, fall asleep to the sound of the surf outside your window.” Sounds good to me. Take a look! It was also used as a shoot location for a movie with Demi Moore called Half Light. The cottage, which only sleeps 2, is one open room, with a bed at one end and the kitchen at the other. 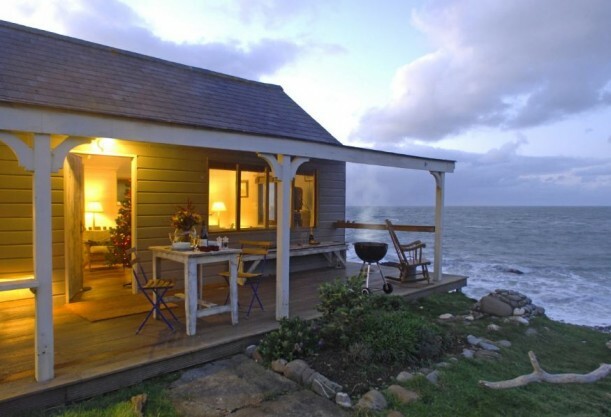 The hut has been overlooking the Cornish coast since the 1920s. The listing suggests that it would be perfect as a honeymoon cottage or a writer’s retreat. Want to take your next holiday here? Visit Unique Home Stays for more photos, rates, and information about the Beach Hut. Check out how it looked in the 2006 thriller Half Light with Demi Moore in my post about it here. 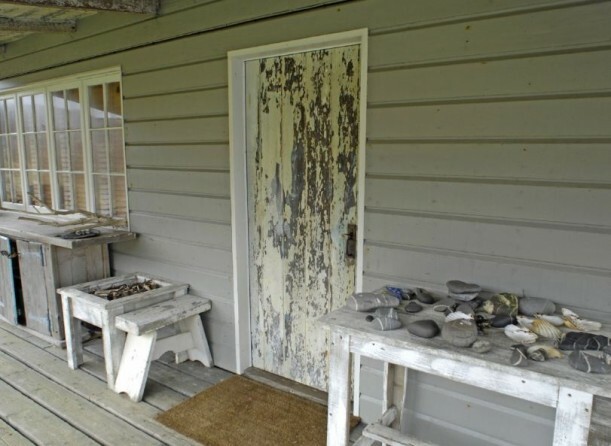 Looks like the house used in “The Butcher’s Wife”. That’s what I was thinking but it’s been so long since I’ve seen that movie , I wasn’t sure. Oh my ! I’m ready to go there. Looks so relaxing. As a writer, believe me when I say I could sooooooo use this beautiful cottage as a retreat! Would love it!! Wow! Is that ever spectacular or what?! I’m sure you could find peace there. WOWZA! What a beautiful setting! Cute and charming cottage as well. no ifs ands about it… this place is adorable. But the character of the place is amazing! This house was used as a location for the movie ‘Half light’ with Demi Moore in 2004 and the movie was released in 2006. Beautiful cottage and location! I think you’re right, Romy. 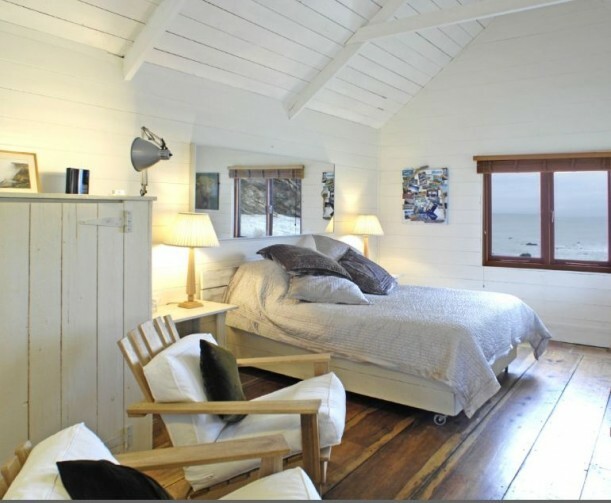 I just looked it up and the description of the “remote cottage on the coast” that she retreats to sounds like this one. Now I’ll have to rent it and see it for myself. Thanks! Just perfect…for an romantic escape! Madly in love with this cottage!! Now I will need to watch the Butcher’s Wife this weekend. You’ve done it again, Julia! I don’t really have a preference for beachy homes or seaside sites but wow! The VIEW! I like the solitary feel of it and it is so beautiful! So simple too. Thanks for the pics! I believe it was in the movie “Half Light”. So impossibly lovely I could just cry. Wow, peaceful. Was Half Light the film where Demi Moore goes to the cabin to write?Does she row out to an island with a light house? I am trying to remember, so long ago. Yes!! I have seen that movie and recognize the cabin… but didn’t remember the name of it. Now I want to see it again!! I was hoping as I read this that it was the cottage from Atonement, but alas no. Still quite lovely! Oh. My. LOVE it. More the beach setting than the cottage. But the cottage is certainly charming. Love the stone hearth in the kitchen. If I were there I would find it difficult to leave. Thanks for sharing such a dreamy spot with us!! I am in love. Seriously. I could live there–the cottage, the view, the porch. Well so long as I can get satellite tv/internet. But its the perfect cozy, gorgeous spot. I can see myself curled up on a lounge chair under a blanket with some hot tea and my cat on my lap. Sigh. Perfection. (well, I do wish the fireplace was more fireplacey). Oh, the Demi Moore movie is ‘half light’. (i’m sure someone else caught it already). I am packing my bags now! 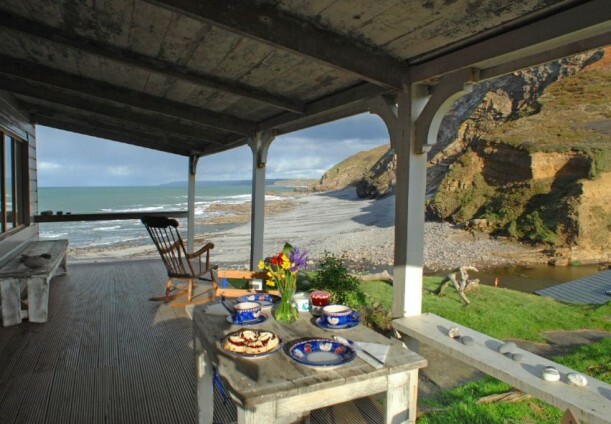 I’ve been to Cornwall and loved it, and I felt my salivary glands engage as I looked at the pictures of that house and the location… sigh… Want badly and not just for a vacay! What a soothing place to be. I feel at peace just looking at these pictures. I would love to stay in a place like this. Love it! I went to Cornwall this summer and it was such a beautiful place to visit. Your post brought back good memories and makes me want to go back to do more exploring. Thanks for your lovely blog. You did it again!!!! What a wonderful “escape” on a cloudy morning!!! Thank you so much for sharing such a unique get away. I went to that site and have only “visited” some of the ones in UK, but SO much fun! It will be a fun site to know about when you need a little visionary vacation! THAT is my idea of Heaven. Pure gorgeousness. Now I do wonder how far it is to the nearest store for groceries…it looks very remote (which I love, but I would need to eat at some point.) Thanks for showing us this wonderful cottage Julia! Stunning. Reminds me of the place used in Scarlet Letter. I am in love with it! Of course at 1500 pounds, plus deposit, for 3 nights, I’d need a major grant to use it as a writer’s retreat. But oh….I yearn! Looks like what we used to call a “3 bears” house with the baby bear maybe sleeping on the sofa or futon? Of course, in most books about Goldilocks and the 3 Bears, mama and papa bear did not share a bed. There was the large, medium and “litty bitty” or “teency weency ” bed. Guess how often this mom read that book to her kids? Umpteen zillion would be the correct guess. Now another one to put on my list of beautiful places I want to capture with my camera! Thank you for sharing this remarkable place! Lovely, but some of the furnishings and decor just aren’t in keeping with the home. Note: the ornate gilt mirror next to a futon? And there is a lot of outdoor furniture inside of the house. It just does not look well put together to me. I would love to visit there! It’s beautiful. Thanks for sharing this one. Agreed: gorgeous. Love its authentic simplicity and it would work well, I think, for any kind of retreat, alone or with someone special. Whoa…now that is livin’!! What an amazing little home in the middle of pure paradise! Simply beautiful! I’m usually more of a mountain person than an ocean person but I could definitely get used to that view! So cozy! Actually this house is my imaginary mental “happy place” where I go for a few minutes every afternoon, to sip coffee and stare at the view. Now everyone will want to go there! I rented the “Half Light” DVD today, because after reading about it here, I just HAD to see the movie. It was really funny, because I never told my wife where I had found out about the hut or the movie. We watched and my wife watched the movie while I secretly went over every detail of the hut! What a location! Without the ghosts, you could have a nice stay there!